The on-line registration deadline is January 31, 2019. Virginia Chapter members whose students register as such and score well will receive recognition from the Virginia Chapter. Awards are yet to be determined. For more information see the national website https://www.nationalspanishexam.org or contact the Virginia Coordinator, Louis Blount at [email protected]. The spring, 2017 National Spanish Exam has been completed. We had 131 teachers register 4, 734 students. A total of 67 schools registered, with 38 being private/independent schools, and 29 being public schools. Geographically, most of the schools are in the eastern portion of the state of Virginia. 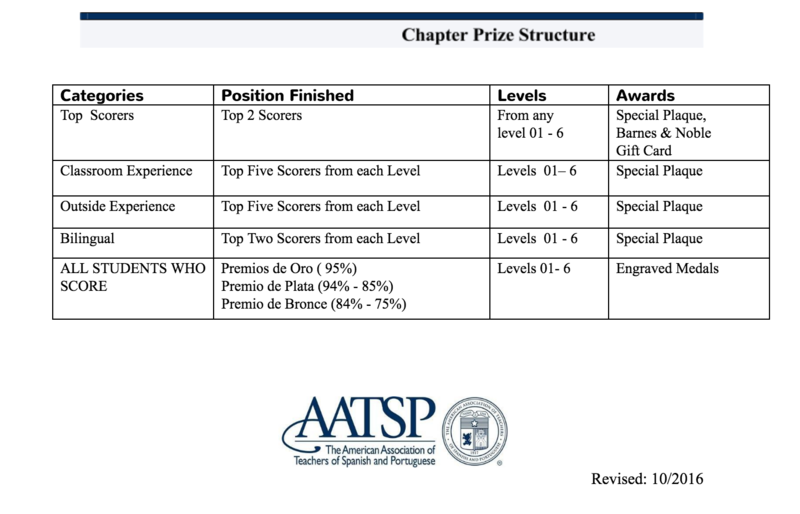 This year our prize structure is the same with students from Levels 01- Level 6 who score in Oro, Plata y Bronce categories (100% - 75%) receiving medals. These will ship out to their teachers. National is experimenting with another Level, a Pre-01, which is for students in an enrichment 6th grade Spanish class. The top three winners in each category, Regular, Outside Experience and Bilingual for Levels 01 - 6 will receive an additional plaque. This year, a change that we must institute as requested by National is not to award a plaque for our Top Private School and Top Public School winners. This is because, it is possible that one of the winners may have a lower score than a second place winner in the other school’s type—private or public. National only wants top scorers to receive the awards. All teachers who had students take the exam received their results on Tuesday, April 25th. Certain categorical and level winners will be placed on our website, once our mailings have been finished. Students’ scores are not allowed to be placed on line, nor can VA-AATSP disseminate teachers’ scores to another teacher at a different school. To promote the National Spanish Exam in the state of Virginia this school year, Kevin Cessna- Buscemi, the Director of the National Spanish Examinations, presented a workshop at FLAVA in Williamsburg this past fall, 2016 in which I was in attendance to assist him. Our financials were approved by National this past August, and are available upon request.